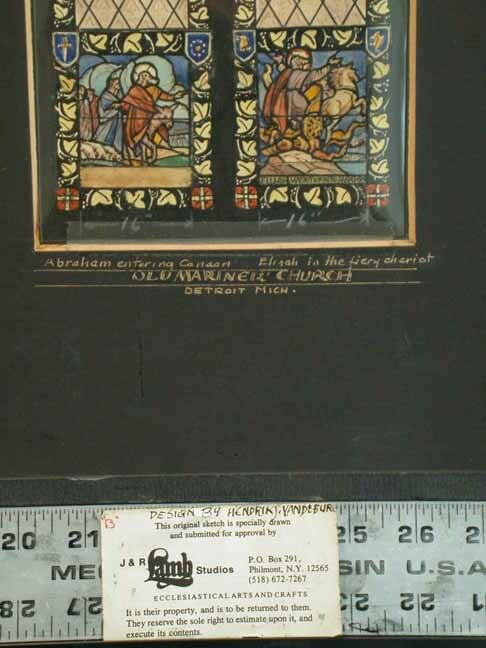 Brief Description of Subject: According to the book "The Windows of Old Mariners' " by Jean M. Fox, the nave windows on the left side were dedicated to different branches of the Armed Forces. This is the second window and is dedicated to the Marine Corps. 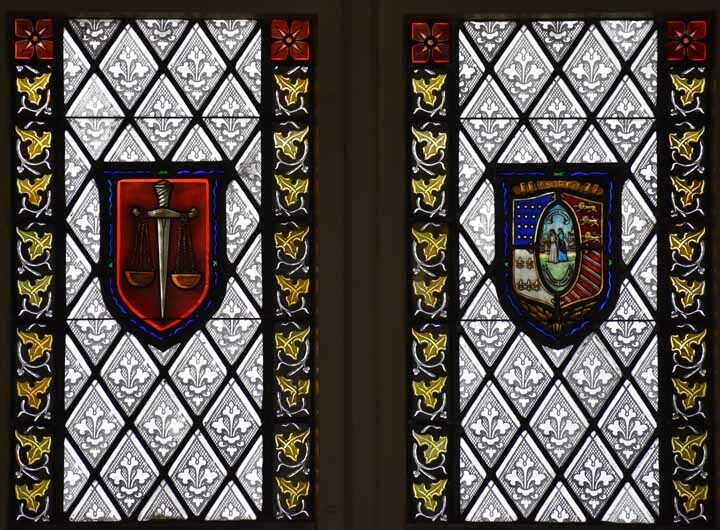 The watercolor sketch for this window by Hendrik Jan Van de Burgh, shows that the window was to have shields of the U.S. Marine Corps and the U.S. flag, however these were replaced on the final design. The "Star of David" is seen at the top of each lancet which in this context symbolizes Old Testament figures. The border of the lancets is decorated with grape leaves --- in the Old Testament they would symbolize the Hebrews as the chosen people; in the New Testament they would symbolize Christ (I am the vine). In the left lancet is Abraham with a knife in his hand. This refers to God's demand that he sacrifice his son Isaac as a test of faith. The scene at the bottom of the lancet is from the "Call of Abram" found in Genesis 12:1-5 (KJV) " Now the Lord had said unto Abram, Get thee out of thy country, and from thy kindred, and from thy father's house, unto a land that I will show you ... So Abram departed, as the Lord had spoken unto him ... And Sarai his wife, and Lot his brother's son, and all of their substance that they gathered, and the souls that they had gotten in Haran; and they went forth to go into the land of Canaan; AND INTO THE LAND OF CANAAN they came." The shields at the top of the scene depict a knife which refers to the sacrifice of Isaac, and 12 stars surrounding the Star of David which symbolize the 12 tribes of Israel --- descendants of Isaac's son, Jacob. 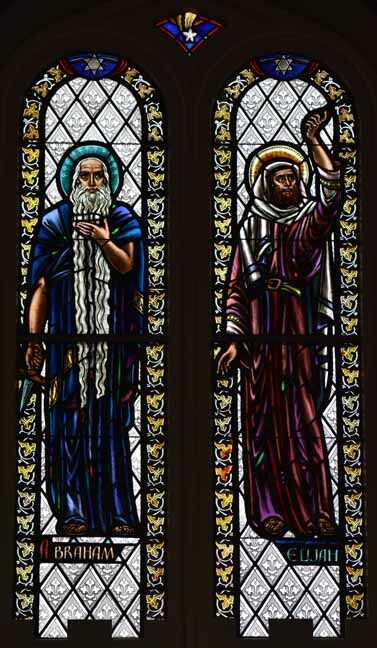 In the right lancet is Elijah who seems to be posed as calling on God --- he did this many times during his life, for example 1 Kings 18 he called on God during a demonstration to Ahab and Jezebel that Ba'al was a false God. The scene below is taken from 2 Kings 2:11 (KJV) --- Elijah is talking to his protégé Elisha and tells him that the Lord will take his master today "And it came to pass, as they still went on, and talked, that, behold, there appeared a chariot of fire and horses of fire, and parted them asunder; AND ELIJAH WENT UP by a whirlwind INTO HEAVEN." On the top left of the scene is a scroll --- symbol for a prophet. 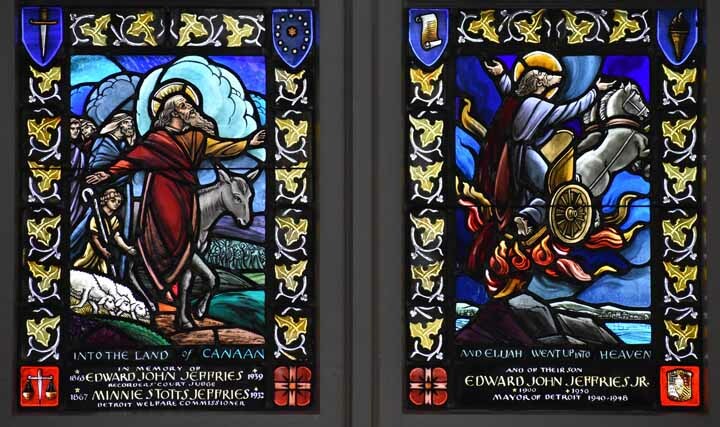 The two large shields refer to the persons memorialized. The "Scales of Justice" symbolize justice is fair and that judgments will be enforced --- this refers to the profession of Edward John Jeffries as Recorder Court Judge. The "Seal of Detroit" refers to Edward John Jeffries Jr., Mayor of Detroit as well as Minnie Stotts Jeffries who worked as the Commissioner of the Detroit Welfare Department.